It was October 1988 – I was looking out the window of a Lufthansa 777 jet en route to Frankfurt. It seemed like a dream – after two years of relentless practice and a few trials and tribulations along the way, our team was on the way to the Culinary Olympics. I thought back to that tryout competition in Boston two years earlier and the subsequent call from Certified Master Chef and team manager – Anton Flory letting me know that I made the cut for the New England Culinary Team. To be honest, I was stunned. I was sure that I was not worthy, but thrilled to have this incredible opportunity. Now, we were just a few days away from laying down our first day of work for the international judges to critique. Every four years when a new U.S. team is preparing for that same experience – I reminisce. I think about the effort that it took to get to that point and how hard it is for every team preparing to represent the U.S. at the most intense international culinary event. There are internal and external challenges that hover over a team in training. There is the looming challenge of raising enough funds to support the team and finding sponsors that will help with product and equipment – this is always on the mind of competing chefs, but they know that their most important job is to develop a winning program, perfect their skills, openly share critique, and most significantly – build a team with a common goal. Only National Teams are allowed to compete in the hot food arena, regional teams such as ours must focus on cold food tables that include buffet platters, hot food presented cold (appetizers and entrees, hors d’ oeuvres), centerpieces (salt dough, chocolate, pastillage, vegetable carvings, tallow), pastry and dessert platters, plated desserts, and petite fours sec and glace. Our team was comprised of 10 chefs, 10 individual talents who grew to become my most treasured friends and colleagues. Our bond became unbreakable and over the years there have been numerous opportunities for us to rekindle our spirit that came together that October in 1988. When it came down to it, the real win for us was more than the critique of judges and the medals pointing to performance – it was the chemistry that evolved and grew, the mutual respect that we shared for each other, and the tone that was set for each of our careers following the Culinary Olympics. ANTON FLORY, CMC – One of America’s first certified master chefs – past Executive Chef at Topnotch Resort in Stowe, Vermont and The Inn at the Mountain, and honored faculty member at the Culinary Institute of America. Tony was our Team Manager, a true mentor, a consummate professional, and a humble perfectionist. He was the reason that we came together and were able to show what we were made of in Germany. Tony passed away in 2010. ROLAND CZEKELIUS, CEC – Roland was full of energy, a proud Austrian who made his mark in numerous operations in the U.S. – including The Boston Park Plaza Hotel, Chatham Bars Inn on the Cape, Planet Hollywood as Corporate Chef, New England Culinary Institute, and as Executive Chef in the Caribbean, a place he grew to love. Roland pushed us to get better while still serving as our big brother. Roland was the Team Captain. Chef Czekelius passed away in 2011. MICHAEL BERIAU, CEC, AAC – Michael (Mickey) most recently – past Executive Chef of White Cliffs Country Club on Cape Cod, has been a prominent culinary figure in the Massachusetts culinary scene for 40 years. In addition to his time with our team he was Corporate Chef for Dole and Bailey, the ACF Northeast Regional Chef of the Year, past coach of the U.S. ACF National Team, and runner up for the National Chef of the Year. He was, in many cases, the glue that kept our team focused and together. JOE FARIA, CEC – Garde Manger at the Boston Ritz Carlton (the hotel where Escoffier made his mark in the U.S.) when our team was formed. Since then he has spent much of his career in Florida, most recently as Executive Chef at Quail Valley Golf Club. Prior to this he served as part of the team at Chatham Bars Inn on the Cape, the Royal Sonesta Hotel in Boston, and Orchid Island Club among others. Joe remains one of the most meticulous and accomplished garde mangers and chef operators that I have ever known. CHARLES CARROLL, CEC, AAC – It would be difficult to fit all of Chef Carroll’s accomplishments in a short bio – in 1988 he was the youngest member of our team, replacing a chef who had conflicts with his job. Charles turned out to be a treasure- extremely talented and confident. After 1988 he continued to serve as Executive Chef at the Balsams Grand Resort, then on to Oak Hill Country Club in Rochester and eventually on to Executive Chef of River Oaks in Houston. He served in various capacities on 7 Olympic teams, won the ACF National Chef Professionalism award, was recognized as the ACF Educator of the Year for his time as facilitator of the Balsams Apprenticeship Program, organized “Operation HOT” through which he and a troupe of volunteers entertained and fed more than 5,000 troops in Afghanistan, authored three books, and recently finished his time as the president of The World Association of Cook’s Societies (WACS). NEIL CONNOLLY, CEC – Crusty, talented, funny, and opinionated, Chef Connolly served as Chef for the Kennedy Family for more than 12 years. In subsequent years he gravitated to operations in Florida – including Avilia Country Club, and Doc’s Restaurant that he owned and operated. Chef Connolly was as accomplished a pastry chef, as he was a savory chef. His chocolate sculptures and dessert platters remain some of the most impressive I have ever seen. A close friend of Emeril Lagasse, this world-renowned peer referred to Connolly as his mentor. 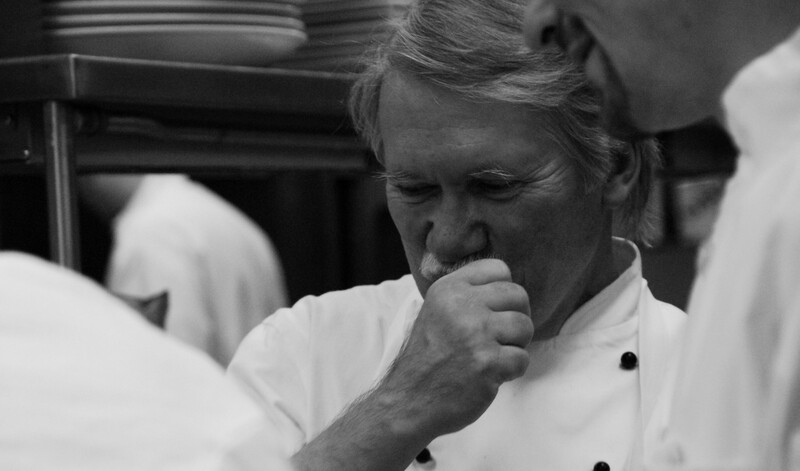 Chef Connolly passed away in 2013. DANNY VARANO, CEC, AAC – Danny was a teacher’s teacher. He spent a good portion of his career as a high school culinary instructor in Connecticut. Accomplished and highly respected, Chef Varano was extraordinary with cold food presentations and one of the country’s finest salt dough sculptors. Aside from his recognitions from the ACF he was also inducted into the Order of the Golden Toque. LARS JOHANNSON, CEPC – Lars was our teams’ YODA. As the seasoned veteran of culinary competitions and former member of the ACF National team, he was able to offer valuable critique that gave us the substance for improvement and preparation. An extraordinary Swedish trained master pastry chef, Lars went on to found and direct the International Pastry School at Johnson and Wales. When he retired, the school named their bakery outlet after Chef Johannson. I have never seen detailed pastry work that can rival his excellence at the craft. GEORGE HIGGINS, CMB – George was the George Harrison of our team. Incredibly talented, quiet, focused, humble, and always supportive of the team effort, George produced pastry work and centerpieces that seemed to come to life. He taught at Johnson and Wales and later moved to the Culinary Institute of America where he continues to serve as a senior faculty member. His time in industry included The Dune’s Club and the Ritz Carlton in Naples, Florida where he served as Executive Pastry Chef. George is a Certified Master Baker who always gives more than he expects in return. WALTER ZUROMSKI, CEC – Walter pushed our team in new directions. His approach towards food was ahead of his time and in that role he relished the opportunity to make us all a bit uncomfortable with our knowledge. This is always what drives a team to improve. He served as Executive Chef at the Charles Hotel in Cambridge, MA where he was recognized as the Boston Chef of the Year. Later in his career, with his Research and Development background firmly in place, Walter formed Chef Services Group that works with restaurants on product development, concept validation, and operational consultation. AND ME: PAUL SORGULE, AAC – Time with the team was a springboard for my career. I stayed in culinary education for nearly 30 years, was recognized by the American Culinary Federation as its Chef Educator of the Year in 2001, returned to industry as Executive Chef at the award winning Mirror Lake Inn and guided them to 4-diamond status, cooked at the James Beard House, served on various ACF committees including as chair of the National Education Services Committee, and in 2012 formed Harvest America Ventures – a consulting and training company for restaurants and culinary schools nationwide. Our lives changed forever in 1988. THE 11TH AND 12TH MAN – There are many others who bring a team together the 11th man would have to be all of our advisors who drove us, ran errands, picked up supplies, cooked for us, and critiqued our work. They are too numerous to even attempt to list, but certainly Gino Corelli, John Carroll, and Tim Klauder, and our apprentice Heather Miller are at the top of the list. The 12th man is shared between The Epicurean Club of Boston and Dole and Bailey (Bud Matheson and his daughter Nancy) for their financial and moral support. They remain our dearest friends to date. Walking from the plane in Frankfurt, we passed through customs with our 2 tons of equipment and product and transitioned into our temporary kitchen home just a few miles from the Olympic venue. Our team was able to use this kitchen, after business hours from early afternoon until 6 a.m. each of the next seven days (five of which were competition days). When we weren’t working on our individual programs, we were helping other teammates with theirs. When we finished in the kitchen we all helped with the set up at the venue. Those chefs showing on that day would stay at the venue until the judging was complete – the rest of us returned for a few hours of sleep, breakfast, and return to the kitchen. We worked 20 hours every day for seven straight days – it was exhausting, but our adrenaline was so high that we kept the pace throughout. Two different chefs showed each day for the five days of judging. Without dwelling too much on performance – our team finished the Culinary Olympics with 19 gold (4 perfect scores), 2 silver, and 1 bronze medals. Every chef won gold and as a result the New England Culinary Olympic Team was awarded the coveted Best of the Olympics. As stressful as the experience was – we stepped off the plane in Germany with a determination to do the best we were capable of while enjoying the experience. Mission accomplished. As our three current teams (ACF National Team, ACF Youth Team, and The U.S. Military Team) start their engines at the 2016 Olympics in Erfurt, Germany, they should know that every American chef who has been there before is cheering them on. We know what it takes and how much work went in to getting to this point. Our teams are the best of the best – they represent every cook and chef in America and will serve as role models and standard bearers for what will wind up on restaurant plates for the next few years. Speaking for the New England Team of 1988 – we are with you! Be the best that you can be and enjoy the experience. To every cook and chef in the U.S. – stand up and cheer on your representatives. To my teammates from the Cinderella Team of 1988 – NEVER FORGET.